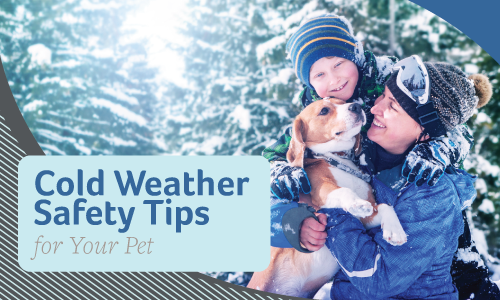 Looks like this winter isn’t going to pull any punches—so here are a few suggestions for keeping your animal companions healthy and happy during the icy months to come. Keep up with grooming. While you don’t want to shave long-haired dogs, you do want to keep the coat and paws trimmed to minimize clinging ice balls, de-icing chemicals, and salt crystals. Don’t bathe too often, however; baths remove essential oils and increase the chance of developing dry, flaky skin. Dry off after being outside. Remove ice, moisture, salt, and chemicals from your pet with a towel after every walk or outdoor excursion. Pay special attention to paws and between toes. Try protecting your pet’s paws and pads with a thin coating of petroleum jelly before heading out. Beware antifreeze. Like coolant, antifreeze is a lethal poison for dogs and cats. Be sure to thoroughly clean up any spills from your vehicle, and consider using products that contain propylene glycol rather than ethylene glycol. More food and plenty of water. Pets burn extra energy trying to stay warm, so feeding your pet a bit more in winter can provide supplemental calories. Hydration is also extremely important in the cold months, and pets need several unfrozen sources of water. Don’t leave pets in cars! Just as vehicles can quickly become ovens in summer, they can also become refrigerators in very cold weather, and pets could freeze to death inside. Bring them indoors. When it’s too cold outside for you, it’s likely too cold for your pet as well. If you have any further questions or need assistance preparing your pet for winter, contact us!